See also: Ground Beef; Cattle; Dairy Cattle; Cows; Ranches; etc. 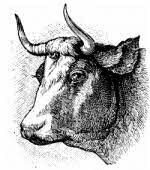 Hernando Cortez brought the first cattle to North America in 1519 (Columbus brought cattle with him on his 2nd voyage to the New World, but not to North America). The character of 'Uncle Sam' is modeled after Sam Wilson, a meatpacker from Troy, New York. During the War of 1812, the meat he shipped to the government was stamped 'U.S. Beef.' Soldiers began to call this beef Uncle Sam’s beef. More beef is consumed on Memorial Day than any other day, with the 4th of July and Labor Day usually tieing for 2nd place. Top 10 list of beef entrees (excluding burgers) in the U.S. In 2007, 97% of commercial restaurants served beef in one form or another. 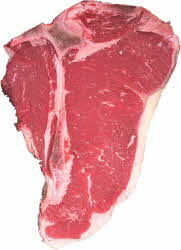 Argentinians eat more beef than anyone else, about 140 pounds a year per person. (The U.S. average is about half that). U.S.D.A. Beef Quality grades are determined by estimating the age of the animal, the amount of fat marbling (determined by looking at the ribeye at the 12th rib) and by the texture, color and appearance of the ribeye. U.S.D.A. quality grading is optional. According to the National Cattleman's Beef Association only about 2% of all U.S. beef carcases submitted for grading are quality graded Prime. Prime grade is the most tender, juicy and flavorful grade, and most Prime grade beef is sold to the restaurant industry. About 44% of the beef submitted for quality grading is Choice grade (the next grade down from Prime), and this is what is usually available in retail markets.